Good morning from beautiful Hamburg and welcome to our last FX Report of this week. The USD continued its bearish trading against the EUR. Additionally we report about the USD regarding to its counterparts from the South Pacific. Anyway, we wish you a nice weekend. The USD continued its trading near to the 14 month low against the EUR and reached 1.5060 as a recovery in corporate earnings and improved prospects for the global economy revived the demand for riskier assets. Furthermore expect investors that the USD will drop for a third week versus the 16 nation currency as reports forecast to show improvements in the German business confidence and U.S. home sales. Also the GBP rose against the USD and climbed to a five week high at 1.6658 on speculation that a U.K. report may show that the British economy grew for the first time since March 2008. Therefore the USD/JPY climbed and reached 91.66. The USD/CHF increased to 1.0057. The EUR climbed against the JPY and strengthened to 137.83 at its highest level. The USD headed for its third weekly decline against the NZD and AUD as regional equities extend an earnings sparked rally in U.S. shares. Also the interest rates are with 3.25% in Australia and 2.5% in New Zeeland higher than in the United States, this is an attractive reason for investors to invest in the South Pacific nations. Since the middle of October, the GBP has been trading in a bullish trend channel against the USD. 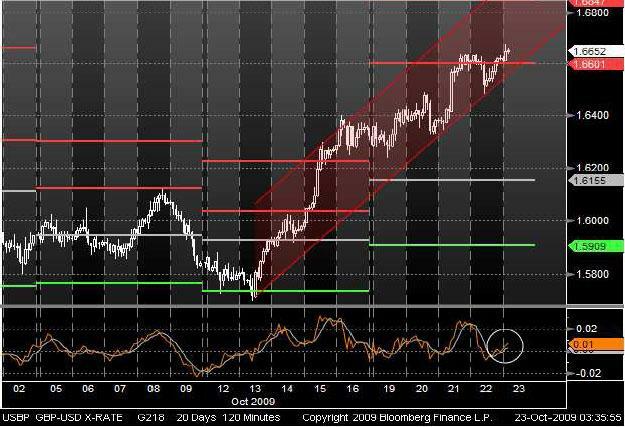 With its second attempt, the currency pair could cross its resistance at 1.6601 and it seems that the breakthrough was successful. Furthermore a crossing Momentum through the signal line from below may indicate that the GBP could continue its trend channel. During the past three months, the CAD has been trading in a sideway trend versus the CHF. 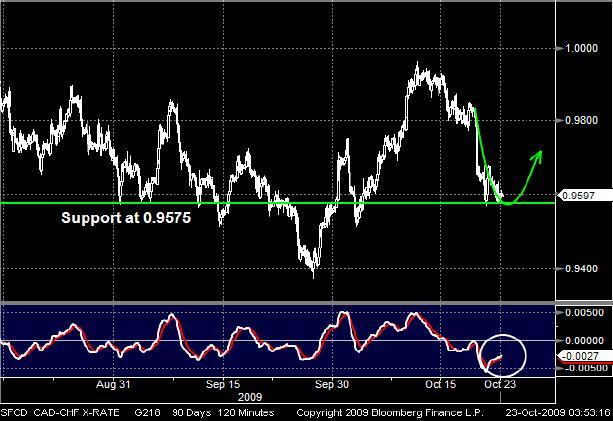 Recently, the CAD touched its support line at 0.9575 and the prices recovered. Now, the currency pair touched its support again and it seems that the support is strong enough as a short time before. Also the crossing MACD may support a recovering trend.